Can I let you in on a little secret? I don’t really like squash. There. I said it. It’s okaaayy but I find the texture is a bit too mushy and sweet for my liking, especially for a vegetable. I prefer my veggies to have a bit of crunch and squash just doesn’t do it for me. Why else would it be called SQUASH? HOWEVER… there is one out of the squash family that I just can’t get enough of. That is the illustrious spaghetti squash. Aptly named because of its stringy, spaghetti noodle-like texture when it’s cooked. It is simply delicious. And it’s a great alternative to spaghetti noodles, rice, or starch in just about any dish. Bonus points — it’s incredibly easy to cook as well. Split the squash in half. 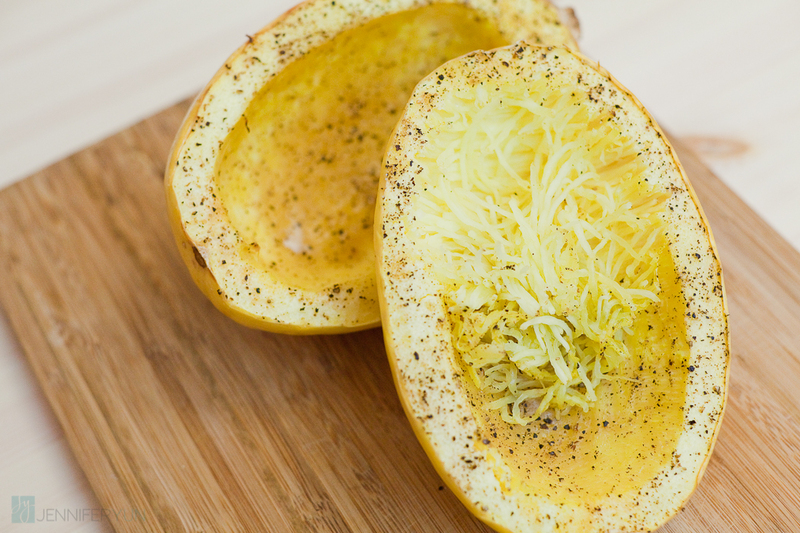 Be careful with your knife skills as this squash has a tough exterior and won’t play along easily. Let the squash sit for a few minutes to cool and then carefully take a fork and start scraping at the flesh. Put all of the stringy flesh in a bowl, mix, and top with whatever suits your fancy! Recipe keynotes: Deliciously crunchy noodle-like alternative for a healthy meal.